Gin Journeys is a collection created for the optimum Gin experience. Steeped in history with inspiration being drawn from Waterford's heritage to gin, dating back to the Victorian era. Waterford's striking range of gin glasses have been designed with tasting experts to help enrich the aromas and infuse the flavors of the botanicals. The Lismore Hiball glass set of two are tall, designed to fully savor low alcohol gin. 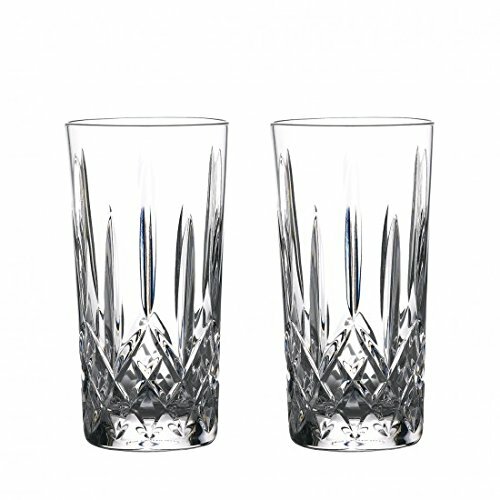 Characterized by the stunning clarity of Lismore's signature diamond and wedge cuts these glasses allow enough space for garnishes and ice for the perfect gin cocktail or iced beverage. Capturing Waterford's rich Irish heritage and the trend in craft gins and sophisticated gin cocktails, this set blends old and new creating a fresh appreciation of this classic spirit. Presented in a sleek 'Gin Journeys' gift box this makes an ideal gift.